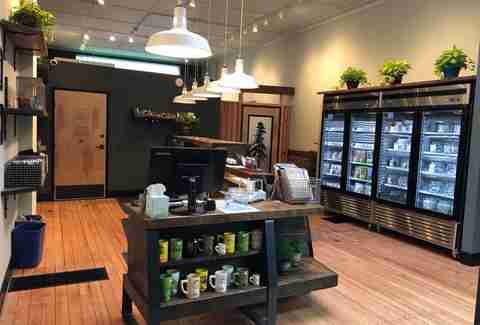 The majority of the 304 licensed dispensaries in Portland care about sourcing chemical-free flower and oils. 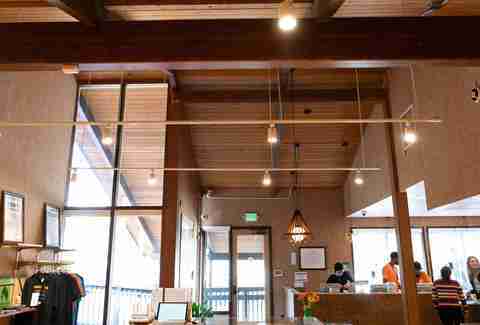 Purity, both in product and in intent, means a great deal to the stoners of Oregon, and that sentiment has produced a culture of politically-active dispensaries. An unspoken requirement to raise the bar, dissolve stigmas, and ultimately foster a more equitable, homegrown, and sustainable cannabis industry. While adventure is encouraged when it comes to the rich, saturated realm of Rip City, here are the 10 all-stars you can’t miss. A groovy little (older?) sister to the polished Serra brand, find the same quality selection with a chiller, Summer of Love-inspired ambiance. Walls are covered in vintage political posters and tchotchkes straight out of your grandma’s attic, while the effects of flower, oils and edibles are categorized by five frequencies: active, aware, groovy, cosmic, mellow and easy. White marble is swapped for tie dye and shag carpet, and there’s a record player in the lounge area for you to sustain the time travel a little longer. Pro tip: their Viva Sativa hats, one-of-a-kind ashtrays, and general EL gear remain some of the strongest pot swag in town. When wall-to-wall racks of products and experienced budtenders seem daunting, you need a simple but reliable shop that won’t overwhelm you with choices. Balancing a polished space with a down-to-earth style, this is an ideal shop for newbies seeking concise quality as well as veterans interested in an efficient, satisfying grocery run. The straightforward menu contains local favorites like Pruf Cultivar, Ten Four Farms and High Noon Cultivation, plus a robust selection of edibles, oils, and vapables. With one location in the middle of the unofficial Central Eastside Bar District and the other in the heart of New North Portland, these friendly shops are a lighthearted break amidst the tourist flurry of hyped up ‘hoods. Co-owned by former educators who have established an internship program teaching employable skills to at-risk young adults of age to consume, Green Hop is redefining what a cannabis dispensary can do. And that doesn’t even include the fact that the Mayor of Portland showed up to celebrate their grand opening, to the tune of ‘90s hip-hop and a backdrop of graffitied walls. They carry a modest but satisfying selection of locally-grown flower, giving each strain a different nickname inspired by the effects, like a mellow Eazy-E. When you’re this far east of the city center, you’ll rarely wait in line for anything. But drive past Archive the day of a fresh drop and you’ll spot a line wrapping around the building. Known for its legendary seedbank of sought-after genetics and authentic, legendary strains, you’ll be picking up straight from the breeders responsible for strains like Scooby Snacks and Do-Si-Dos -- a dizzyingly giddy OG Kush Breath genotype of Girl Scout Cookies. That also means that in addition to an expertly curated menu of house-grown buds and the best in the west, there’s a phenomenal selection of seeds and plant clones to boot. 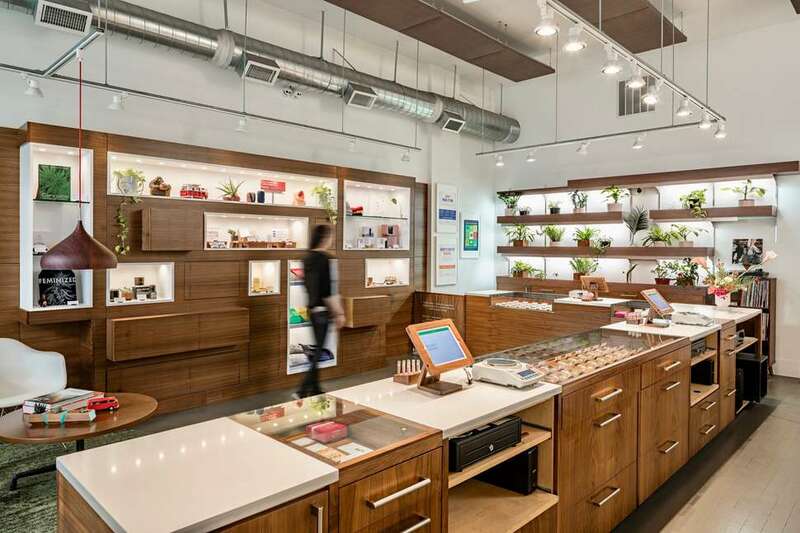 If a scientist opened a cannabis dispensary, this would be it. And in this case, a weed scientist did open up a dispensary… and the smoking crowd has benefited greatly. Farma is the place to send anyone, whether they're 21 or 91, who doesn’t know what they want. This shop’s collection of high-end, in-house growers and flower from standouts Green Bodhi and Nelson and Co. Organics means the selection hangs with the best. With thoughtful branding meant to mask the (often ugly) childproof containers required by the state, this dispensary has given us nothing that doesn’t look like a gift. Find TreeHouse under the billboard denoting the start of the Green Mile, a collection of cannabis dispensaries on the diagonal Sandy Blvd, which stretches for many miles. But if you’re looking for extracts and/or concentrates, this place is the only stop you’ll need to make. Known for variety as well as exclusivity, they carry the latest extracts and concentrates from across the state. As far as live resin, rosin, and BHO go, THC is your best bet for adequate stock across the board. And the flower? That keeps a whole other steady crowd coming out to this part of Sandy. Stickers for this shop are everywhere: on bridges, on outhouses, on sidewalks -- pretty weird considering neither of the outposts are within walking distance of Downtown. This place once sold a 1-gram Oregon Lemons joint so strong it nearly knocked Tom Sizemore out before he started talking like a conspiracy theorist, pledging to call whenever he’s in town for the hookup to the good stuff (true story). There’s also a wide variety of strains from local growers, along with glass and other toking equipment. Grab some of whatever you need, but don't leave without a 1-gram of pre-roll. Jayne has charmed Portlanders with a serene, botanical space and a user-friendly approach to providing a large variety of herbal goods. Details like mossy green decor and a tangible, bound paper menu give respect to the natural roots from which this industry is growing, and thoughtful extras like non-infused candy and chips keep the airy space grounded. Find a large selection of edibles and topicals in particular here, including various transdermal patches, sensual oil, and multi-use tinctures from Luminous Botanicals that can be applied topically or eaten. With two locations -- one in the fancy Pearl District and the other next to the Convention Center -- Oregon’s Finest is hard to miss. With multiple high-end strain options from growers regularly featured in all the cannabis magazines, this is an easy one-stop shop if you’re Downtown. The three-pack of joints seems pricey at $40, but their potency allows them to be shared, so don’t hesitate to grab those half-gram rolls before checking out. 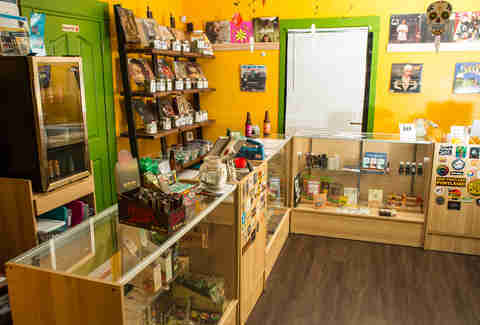 Its selection of oils is mostly top shelf, and the edibles are the state standard for packaged goodies. With a white marble aesthetic and artistic details down to the custom floor tiles made to match a signature geometrical pattern, Serra defines posh pot in Oregon -- if not the West Coast. But the attention paid to the interior design is also reflected in their vast selection of unique, terpene-laden flower from the groundbreaking Pruf Cultivar. When they released a Serra edible, it was a gently dosed 20mg chocolate bar made with cacao that was sourced and roasted by Portland chocolatier, Woodblock Chocolate. If it’s in Serra, chances are whatever you buy will be beautiful, potent, and cautiously sourced. Lauren Yoshiko is as close to a cannabis culture critic as the hazy concept allows. She opened a dispensary, managed a dispensary, and managed a farm in Southern Oregon for two years, all the while reporting on every facet of the industry for various publications. Follow her on Instagram at @laurenyoshiko for aesthetically-pleasing smoking tables, mild cat content, and nail art.